Burberry have been championing a great look lately - namely the "fancy t-shirt with pencil skirt" look. And two girls who have got this combination down pat are Michelle Dockery (who hasn't put a foot wrong since winning us all over in Downton) and Emma Stone. 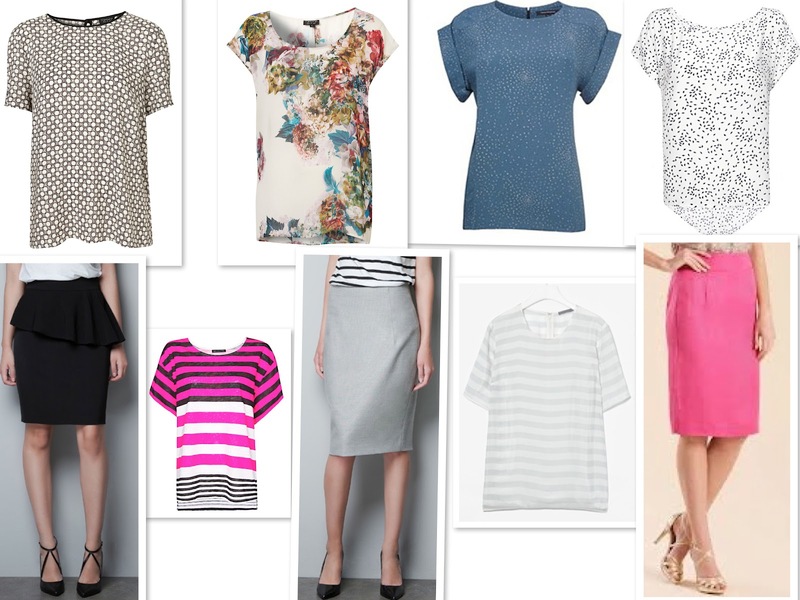 The main two ingredients are an interesting t-shirt - something with a pattern, some texture or detail, and a pencil skirt. Then add a pair of high heeled court shoes or ankle boots, and maybe a statement necklace, and you're done. Boost the glamour stakes in the evening by adding a little more interest to your pencil skirt, by wearing one in a velvet or brocade fabric, or one with a peplum. Circle print panel tee, £34 Topshop; hyacinth floral tunic tee, £36 Topshop; ditsy moonlight top, £56 French Connection; button back blouson, £9.99 Mango. Pencil skirt with frill at waist, £39.99 Zara; loose fit striped t-shirt, £8.99 Mango; sheath skirt, £25.99 Zara; striped silky top, £59 Cos; Penelope skirt, £45 Monsoon.